Every night the girls get their Critter Love and a dish that has cantaloupe, blueberries, blackberries, apple, a little mango, and raspberry(which they never eat). They were getting papaya too but because of the salmonella problems I've been afraid to buy any brands I rarely see. They'll eat the cantaloupe, apples, mango, blueberries, and mango. In their veggies dish I put kale, bok choy, peas, a little corn, string beans, and a little bit of yellow, orange, and green peppers. They'll eat the corn, peas, and string beans. They have Pet Pro Happy Glider pellets during the day that they don't really touch since they're sleeping but if they wake up before I get their fruits n veggies rdy they'll have some of it and I throw a few pieces in their pouch I'll hear them crunching on it. In the morning when I wake up I feed them some yoggies. Yuki doesn't want the white ones so she gets half a the Vitaraft or whatever its' called Strawberry one and little dried piece of papaya. They also get some mealworms and waxworms which I play tug of war with so they don't get the whole thing in their mouth and choke. They little tear it apart and eat little pieces as I pull it from them. They seem very healthy and super energetic. 3 of them are 80g and one is 60g(Roxie, she's smaller than the others. None of them are fat. I would say they're lean and fit gliders. The past few months they don't seem to eat their Critter Love as much. I know at least some are still eating it because it's splattered on the inside of their glider kitchen in the morning but for four gliders I don't think they'd even finish two tables spoons of it, never mind the three I give them as is. Am I feeding them too much and giving them too much variety? I'm worried about the calcium/phosphorus ratio. Should I putting some of the Suncoast Blueberry calcium stuff on the mealworms? They LOVVVVE mealworms and wax worms. They'd eat them all if I left the container in there I'm sure, but I limit them. What does everyone think? No, don't sprinkle any calcium on their mealworms. I would pick one of the 4 and try it out. You can cut the recipe in half as you are only feeding a couple gliders. Also if they are not cleaning up their staple diet, it is because they don't need the protein in their diet at that point. A few days, weeks or months down the line they could start cleaning it up again. 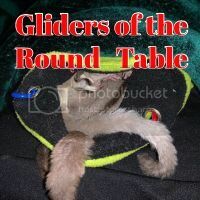 My gliders do this, but it usually only lasts a couple days with them and they are back to eating all their staple. They may be holding out for treats. Mine have been on CL complete and for a solid 2 years now. I have reduced their staple down to 1.5 Tbs (for 2). I check every morning, and what they eat varies. From licking it clean, to leaving a small amount, to barely touched. All from the same batch. I have never varied on their salads without Peggy's approval. Having said that, I do know my girls rarely eat the leafy part of bok choy, kale, or other similar greens. So I trim part of the leaf out, weigh stalks to get proper portion. All the cutting and trimming does have a juice which will in corporate on to other f/v. I also mix f/v together as a complete salad. And freeze. Mine rarely eat everything, but I take note of what they did eat. That varied nightly. All corn and peas hulled and gone. Carrots have been chewed at, they hull the green beans sometimes. I have cut back on portions of salad, But before you do that, I would cut out treats for at least 3 days. Then see what is left. Go back to treats maybe 3 times a week. Have a cheat night once a week. I do boiled chicken wings chicken feet are a favorite, but I can't stand to look at them let alone clean out the left overs.Anyway, on cheat night, I cut back on sale and staple. You have reminded me to ask Peggy a question... But I will make a post later on that. I've been using Salad 3 minus the cucumber since they didn't touch it when I used it. I use green beans to replace the yellow wax beans since I've never been able to find them and I know they eat the green beans. On occasion I also try kiwi but they don't seem to care for it. I also add cactus fruit on occasion because I know they like it and it's got a good calcium ratio. Last night they ate almost all the fruits and had the string beans, peas, corn, and some of the kale. I reaalllly wish I could feel safe using papaya again because I know they liked it and they calcium/phos ratio is good. Once again they only had a little bit of the CL. In the morning it was that oily surface with the sediment on the bottom. They used to love it when they were really small. It's so hard not giving them treats though, lol! In the morning they want their yoggies! I bought two scoops of mealworms and about 20 waxworms. Going to try to get through them and them be less.. Treatful towards then.